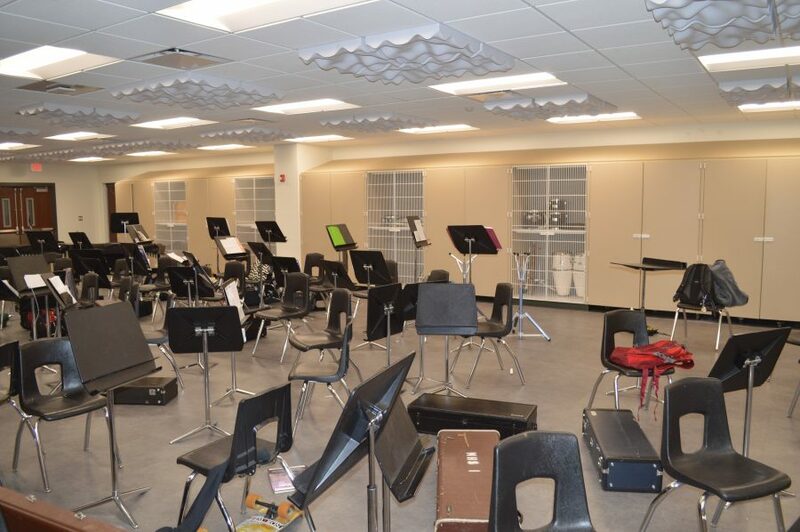 Shown is the remodeled band room at Wawasee High School. The “pit” was removed and the floor was leveled. Board members rode a mini-bus to the sites along with Dr. Tom Edington, Wawasee superintendent; Kim Nguyen, Wawasee High School principal, Jon Everingham, director of the Wawasee Area Career and Technical Cooperative; Jim Evans, director of finances for the school corporation; and James Flecker, director of personnel and legal services for the school corporation. The first stop was the new Syracuse Elementary School. Work continues ahead of schedule at the site and it has been sealed up enough for work to continue through the winter months. Edington noted if work continues at the current pace, the new school will be moved into during the month of July 2017. Drywall was recently hung in the office area near the main entrance and one room with an air conditioning unit and an electrical breaker behind where the technology room will be located is essentially finished. Next was a stop at the former Veterans of Foreign Wars Post building on Chicago Street in Syracuse, east of the high school. The 8,600 square-foot building on a 1 acre lot is being donated by the VFW to the school corporation, pending school board approval. Nguyen noted the front room could be renovated and used for the alternative school. Students would spend half their time in academics and the other half possibly working with career and technical education projects. “We want to promote skill building and not just have students sitting in front of a computer all day,” he said. The back portion of the building has a large open space that would work well for the welding program. Or the space can be utilized as needed. Board member Rebecca Linnemeier noted the CTE offerings are good, but asked Nguyen what is being done to keep the students challenged who take advanced placement and dual credit courses at the high school. Nguyen said he wants to talk with teachers and administrators and analyze course offerings to see which ones need to be dropped due to lack of interest. This would make more room for other courses to keep students challenged. He said computer science is an area he wants to explore more and programming classes are non existent at the high school. “In this world of technology, it is probably not good to not have some type of a computer programming course at a high school,” he said. Board members also toured several completed renovation areas at the high school including the media center, office area, art room, dark room, choir room, technology room, band room, concessions area and the brickyard. Work began after the end of the 2015-16 school year in these areas and was not finished until several weeks after the start of the current school year. Some equipment needs to be delivered to the media center, which already includes a collaboration area for students, TV monitors and more. The “pit” in the band room was removed and the room was made to be more level. A wall was removed to expand the art area. The choir room was re-configured and the risers and mirror face different directions than before. And the concessions area now has a circular shaped counter.